What are the best hose connected sprinklers and how many can you connect together? If you don't have an irrigation system for your lawn you'll probably be setting up hose connected sprinklers at certain times like when you've spread grass seed or some fertilizers that need to be watered in or kept moist or if you want to keep it looking green and lush during the hot, dry summer. There isn't a simple answer to how many sprinklers you can connect to one hose because you'll need to check your water pressure and flow rate which will be different for most people. 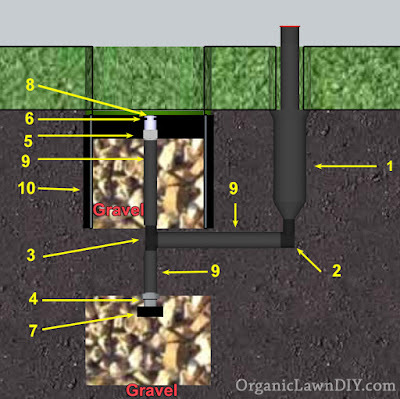 They're very simple to check and I'll show you how to connect them to get the best use without wasting water. I also recommend using Hunter MP Rotator sprinklers because you'll be able to run more of them simultaneously compared to other sprinklers. Why More Than One Sprinkler? There are a few different DIY sprinklers out there like LawnBelt and Watering Made Easy but I'm not a big fan of them because they don't deliver water efficiently. Plus you can build your own system better and cheaper. There are also a bunch of different types of single hose-connected sprinklers sold and many are marketed as if one sprinkler will be enough. It won't. If you want to water your lawn evenly and you don't want to waste water you'll need more than one. We'll use a fairly simple 35' x 35' patch of lawn. If you have a let's say a single sprinkler, maybe a rotor or impulse sprinkler, in a corner set to 35' distance you can clearly see that the upper right hand corner isn't getting watered at all and the area that is getting watered isn't getting watered evenly because sprinklers have a higher precipitation rate closer to the sprinkler head than they do at the edges. Same problem if you just have the sprinkler in the middle, even if it's one that has a square pattern. The light blue area shows the water distribution in the illustration. So you may think you'll just get a sprinkler that throws water 50' which will cover the entire 35' square patch of lawn. Now all your lawn is getting wet, and so is your sidewalk, house, neighbor's lawn, walkway, patio, or whatever is just past the lawn area. You also still haven't solved the problem of uneven watering. If you set your timer to water so that the edges get enough water you'll be drowning the lawn near the sprinkler which at best is wasting water and at worst is promoting disease. With 2 sprinklers both set at a 35' radius at opposite corners you'll do a lot better than with just 1 but with 4 sprinklers at each corner set at 35' you can see you get very even coverage. This is how professionals design sprinkler systems with head-to-head spacing. One sprinkler head is positioned at the edge of where another sprinkler leaves off it's watering so that the two overlap and provide an even distribution of water. As you plan out where you'll put your sprinklers with head-to-head spacing you'll notice you probably need more sprinklers than you first thought. This is why it's important to know how many sprinklers you can run off your garden hose if you're using hose-connected sprinklers. The first variable you'll need to determine is the static water pressure in your water lines. This is very easy to figure out. Just get yourself a Rain Bird P2A Pressure Gauge and attach it to your hose bib (aka sillcock or outside faucet) where you would normally attach your garden hose. Make sure no other water fixtures are open then open up the valve to your hose bib all the way and read the pressure on the gauge in PSI. Write this down, this is your static water pressure. You need more pressure than just the pressure required by your sprinklers to account for pressure loss in the pipes and other fixtures encountered along the way. For example if you plan on using sprinklers that run at 40PSI you're going to need to have more than 40PSI of pressure to account for the pressure drop caused by items in your water supply such as valves, pipes, filters, backflow devices, pressure regulators, etc. You can look up the pressure loss for all the different devices that lead from your water supply, through your home and to your sprinkler, or you can just hook up everything you'd have hooked up when the sprinkler is functioning, such as vacuum breaker, timer, hose, etc. and see if the sprinkler works. Measure the distance the sprinkler is throwing water and compare that to the specs the manufacturer supplies to figure out how much pressure is getting to the sprinkler. If the manufacturer lists the specs of the sprinkler as having a radius of 10' at 40PSI and you measured a 10' radius on your sprinkler you have 40 PSI available to the sprinklers. One important thing to note, you won't need 40 PSI for each sprinkler head. So if you have 40PSI after subtracting the pressure drop for different devices you can run multiple sprinkler heads. If you have adequate pressure to run one sprinkler in your test you should be able to run multiple provided you use a large enough diameter hose (at least 5/8" but it might be cheaper to get 3/4" or larger poly pipe and make your own hoses if you want to run a lot of sprinklers) and have sufficient water flow which we'll get to next. If you have enough water pressure to run the sprinklers the next important variable to consider is the volume of water that you can get to the sprinklers. This is fairly easy to measure. Grab a 5 gallon bucket and time how long it takes to fill it up with a hose that's connected as if it was set up for your sprinkler system. Meaning attach the timer, the vacuum breaker, the diameter hose you'll be using etc. If it took 40 seconds to fill the 5 gallon bucket the flow rate would be (5/40) * 60 = 7.5 GPM. That is the maximum water flow you can get but there are certain situations where your plumbing may deliver water at a higher flow rate than is safe. If the speed of water flowing through the pipes is greater than 5 feet per second it can be hard on your system, make it fail sooner and cause issues such as water hammer. The main variable that determines the maximum safe speed at which water flows through the pipe is the inside diameter of the pipe. You should inspect your plumbing system from the point of contact with your water supply, through your meter all the way to where you connect your sprinklers to find the smallest pipe and use the maximum safe flow of that smallest pipe to be the maximum flow rate you design your system for. For example if you have 3/4" pipe coming from the city water main to your meter and 3/4" pipe going to your house bib from your inside plumbing but in between the meter and where the hose bib connects is 1/2" copper pipe, you need to design the system for the maximum flow that 1/2" copper pipe can handle. Here's a table showing the maximum flow rates for various pipes and diameters that are commonly used in residential plumbing. The inside diameter of garden hoses isn't as consistent as plumbing pipe which is another good reason to make your own hoses using 3/4" or larger poly tubing and fittings. If you plan on going with sprinklers that use a high flow rate and you're going to have long runs of hose/pipe try to go with a large diameter for the hoses to minimize the pressure drop in the pipes caused by friction. So now you know you have enough pressure, you know the maximum safe flow for your system which is the maximum flow of the smallest inside diameter pipe you found in the chart above or the maximum flow you measured with the bucket, whichever is smallest. To figure out how many sprinklers you can attach to your hose that will all run at the same time, divide your max safe flow by the GPM of the sprinkler. If you're using sprinklers with different flows, subtract each one individually from the max safe flow until you still have a positive number. So if you're limiting flow is the 1/2" Type L copper pipe in your home's plumbing for example, your max flow will be 3.6 GPM. If all your sprinklers flow rates are 1GPM you can add 3 of them on the same line to run simultaneously. If you need more sprinklers you can set them up on a separate hose and run them at a different time, essentially creating sprinkler zones. They deliver water through rotating streams at a much slower rate than traditional spray nozzles which will consume less water flow as well as allow the water to seep into the soil to prevent runoff. With Hunter MP Rotator nozzles you can connect more sprinklers to your hose. Let's pretend we have a 30' x 30' square patch of grass we'd like to water and we want to use 4 sprinklers to get even coverage to avoid over or under watering our lawn. Most of the plumbing in the home is 1/2" Type L copper pipe which limits our safe water flow to 3.6 GPM even though our high water pressure actually can deliver more. The actual water pressure delivered to our sprinklers will be 45 PSI. If we used Hunter's PGP Rotor sprinkler on spikes and connected them up with hoses. At 45 PSI, using the smallest nozzle for the PGP sprinkler, each sprinkler would consume about 1.5 GPH to reach 30' for a total of 6 GPH for all 4 which exceeds our safe maximum flow. The most we could attach would be 2 PGP sprinklers. If instead we use Hunter's MP3000 Rotator Nozzles at 40 PSI they can cover the same 30' but each one only consumes 0.86 GPH set at a 90 degree angle for a total 3.44 GPH for 4 nozzles. That will work with our design constraints. For smaller areas the water consumption of MP Rotators can be as little as 0.19 GPM. There are different size MP Rotators and their flow will vary by their adjustable radius, check out Hunter's site for MP Rotator specs. They cost a little more than other spray nozzles but their low flow rate has many benefits. In addition to delivering water at a slower precipitation rate that minimizes run off, if your home's plumbing doesn't have large pipes, using MP Rotators can save you considerable plumbing costs that would be necessary to deliver a higher volume of water for other sprinkler types. If you know even a little about MP Rotators you'll know they're meant to be used with pop-up sprinkler bodies found in in-ground sprinkler systems. You can't directly connect either to a garden hose but there are some ways around that. Note: Even if you're just running a garden hose without sprinklers it's a good idea to have some sort of vacuum breaker. It could be as simple as this vacuum breaker that screws on your hose bib but check local codes to see what's appropriate in your area. These metal irrigation spikes are available. It's a metal spike you can push into the ground and they have 3 connection points. One female port with hose threads that you can connect the male end of a garden hose, one male port with hose threads that you can connect the female end of a garden hose and one 1/2" port with pipe threads that accepts a standard 1/2" sprinkler riser. These are the same risers used to connect pop-up sprinkler bodies to irrigation pipes. The MP Rotators work best at 40 PSI and Hunter makes a PRO Spray 40 PSI body but you don't need a pop-up sprinkler on a spike so it's simpler to just use a Hunter Pro-Spray PRS40 HUPROS00PRS40 Shrub Adapter . It has a 1/2" pipe threaded inlet on the bottom and you can screw in an MP Rotator Nozzle on the top. Connect one side of the spike to the garden hose and run the other side to another hose going to another sprinkler. The spikes come with caps on one end. When connecting spikes together you'll remove the cap but keep one on at the end of the run. Another option is to just use pop-up sprinkler bodies and bury them in the ground. We just need to provide a way to attach a hose and it would be a good idea to add an auto drain so that it won't get damaged in the winter if you live in a climate where the temperature can drop below freezing. 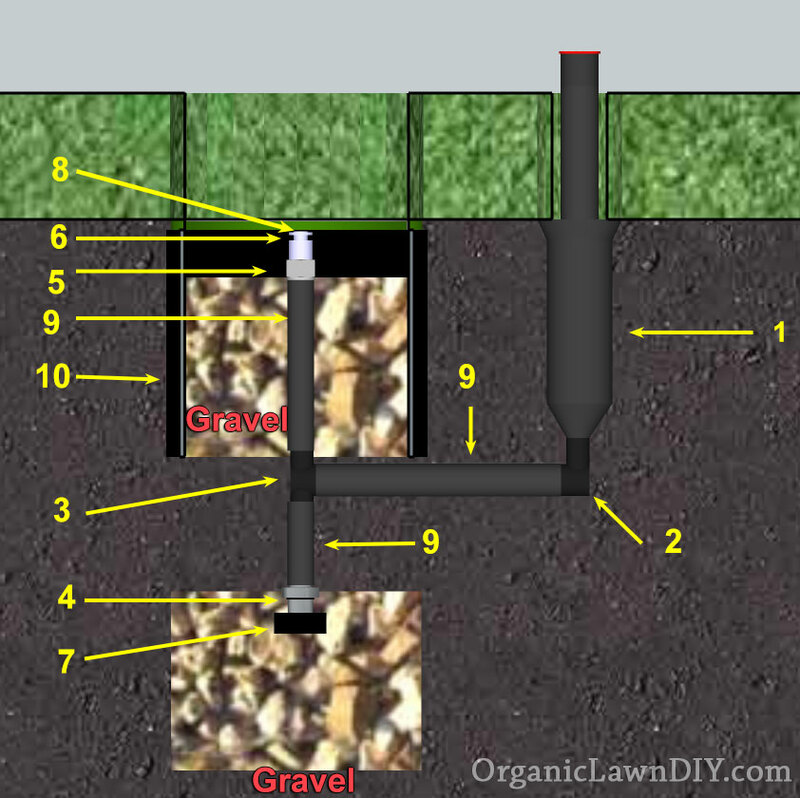 Here's how to hook up one in-ground sprinkler to allow you to attach a garden hose to it. To connect more than one pop-up sprinkler just ad more pipe,fittings and sprinklers but you only need one valve box and hose connection for all the connected sprinklers. Just remember to keep the number of sprinklers within the design parameters. If you exceed the flow, add the other sprinklers to a new "zone" with it's own hose connection and valve box. Just make sure you locate the auto drain at the lowest point in the line. It doesn't necessarily need to be under the hose connection.